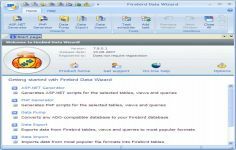 Firebird is a relational database that can better manage your database and to track the behavior of your SQL programs. By implementing this tool you can refresh your data and make the correction scripts. The software runs on Windows 95/98/Millenium/2000 / XP platforms. SQL Monitor Interbase / Firebird is a freeware software. Firebird offers good performance regardless of the size of databases, ranging from a few kilobytes to several gigabytes, without slowdowns. Among the features there can be mentioned multi-generational architecture, support for external functions (UDFs), the ACID transaction model, full support of Stored Procedures and Triggers, full internal language for Stored Procedures and Triggers (PSQL), support for External Functions (UDFs), full implementation of cursors in PSQL, incremental Backups, referential Integrity, many third-party tools, including graphical tools aministration, replication, etc, many drivers database access : Napi , dbExpress driver , ODBC, OLEDB , pilot Net native JDBC type 4 driver module, Python , PHP , Perl, etc and more. Context variables WIRE_COMPRESSED and WIRE_ENCRYPTED were added to the SYSTEM namespace to report compression and encryption status, respectively, of the current connection. See Context Variables: v.3.0.4 for details. Enhanced reporting of errors when a dynamic library fails to load. For more information, see Better Reporting on Dynamic Library Loading Errors. When an external function (UDF) causes an error of the type "Arithmetic exception, numeric overflow, or string truncation", the error message will now include the name of the function. The API now supports passing the DPB/spb item ***_auth_plugin_list from an application to the client interface. More details. Two new context variables LOCALTIME and LOCALTIMESTAMP that are synonyms for CURRENT_TIME and CURRENT_TIMESTAMP, respectively. They can be used in Firebird 3.0.4 and later, for forward-compatibility with Firebird 4. See Context Variables: v.3.0.4 for details. The read-only restriction for system tables was relaxed to permit CREATE, ALTER and DROP operations on their indexes.